DALLAS -- The family of a Liberian man diagnosed with the first U.S. case of Ebola again visited him at the hospital Tuesday but declined to view him via video, saying the last time had been too upsetting. Relatives of Thomas Eric Duncan glimpsed him using a video system at Dallas' Texas Health Presbyterian Hospital on Monday. But when they returned the following day, this time with Rev. Jessie Jackson, they decided such images were too much. "What we saw was very painful. It didn't look good," said Duncan's nephew, Josephus Weeks. Weeks said he and Duncan's mother were unable to sleep after seeing Duncan's face. 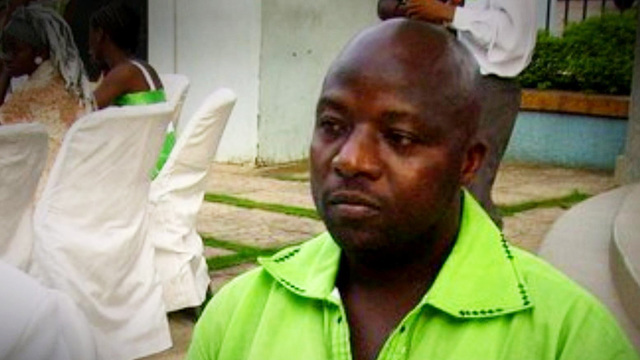 The hospital says Duncan, who was diagnosed with Ebola on Sept. 28 after initially being sent home, remains in critical condition and is sedated but stable. "He is on a ventilator and receiving kidney dialysis," hospital spokesperson Candace White said in a statement Tuesday afternoon. "His liver function, which declined over the weekend, has improved, but doctors caution that this could vary in coming days." Duncan will continue to receive the experimental medication brincidofovir, White said. The drug, manufactured by Chimerix Inc, was developed to treat other types of viruses. Laboratory tests suggested it may also work against Ebola. Doctors in Nebrasaka announced they were using the same medication to treat freelance cameraman Ashoka Mukpo, who returned to the U.S. on Monday. "After looking at the data on this drug, collaborating with the CDC and FDA and speaking with the patient and his family, we decided this was currently our best option for treatment," said Phil Smith, M.D., medical director of the Nebraska Medical Center Biocontainment Unit. "Every patient is somewhat different, and we believe brincidofovir is the best choice." David Lakey, commissioner of Texas' Department of State Health Services, walked the hospital ward housing Duncan, which is otherwise vacant. He said security and medical officials wear gowns, double gloves and masks, and are following protocols on removing them and showering when they leave the ward. "They are doing their work very safely," Lakey said. At a prayer vigil at the hospital Tuesday evening, Jackson called on the public to show compassion to Duncan and his family, not to ostracize them.